What exactly are bleachers? “Bleachers” is the common word used to describe the raised, tiered stands found flanking amateur public and private sports fields or at other outdoor event venues. Bleachers are long rows of plank bench seating, typically designed in an alternating steps-and-seats configuration. They range in size from small, modular, aluminum stands that can be moved around football, soccer, field hockey, or softball/baseball fields (so-called tip-n-roll bleachers) to large permanent structures that flank either side of a high school athletic field. They typically represent a permanent seating solution that is fixed in place, anchored and not moved. Bleachers are hollow underneath, aside from their support structures. Indoor gymnasium bleachers are usually attached to the walls on either side of a playing court and slide on a track or on wheels to retract when not in use, and extend for event seating. These are often called telescopic bleachers or telescoping bleachers. Traditionally, telescopic bleacher seats have been made of wood, but more recently, technology advancements have caused a change in design and material to eliminate the chronic problem of bleacher sag which, over time, prohibits older systems from retracting and being stored away. Molded plastic seats and an aluminum frame are the preferred materials for telescopic/telescoping retractable bleachers today. As a rule of thumb, bleachers seat one spectator every 18′ per row. So a 3-row by 15-foot bleacher will accommodate 3 rows x 15′ x 12″ per foot = 540″ of seating, divided by 18″ per spectator = 30-person capacity. Elevated Scorers Platforms raise the scorekeepers and photographers to a clearer sightline. Scorers platforms are commonly requested. A variety of other commercial site furnishings may also be needed for your bleacher installation depending on your needs. These may include players benches, barricades, bollards, bike racks, picnic tables, trash receptacles or more….Call US with your requirements! Where does the word “bleachers” come from?The Chicago Tribune coined the term “bleachers” in 1889. Bleachers are usually located in the area just past the outfield fence of the left and right fields in many baseball stadiums. Because this part of Wrigley field is not covered, the sun beat down on it and caused the color of the seats to fade, or “bleach”. Anyone who has done a load of laundry knows the word “bleach” means to make white or lighten the color of something. The word “bleachers” is now a part of our everyday language. Rarely made from wood today, with aluminum as the material of choice, this type of seating is common in other types of arenas, and is even found indoors in gymnasiums, usually in a fold-away telescopic configuration. Did you every notice that at Wrigley Field, Yankee Stadium, and almost all other stadiums with outfield bleachers, there are empty bleachers in center field? The centerfield bleachers are in the line of sight of the batter while watching the pitch. If occupied, they would be distracting and it would prove difficult for the batter to follow the ball. Thus, these bleacher seats are intentionally left empty, and usually painted a dark color (black in the case of Yankee Stadium centerfield bleachers) to provide a dark contrast to the white leather of a baseball. The seat painted red in the bleachers marks the spot where Ted Williams hit the longest home run in Fenway Park history. The Indianapolis Motor Speedway is the largest sporting facility in the world. Its bleachers contain over 257,000 permanent seats, and when additional infield spectator seats are added, the Speedway can hold over 400,000 people. ADA Bleachers – bleachers customized with wheelchair spaces, companion seats and other features (such as ramps if necessary) to comply with guidelines from Americans with Disability Act. Aisles – passageway to provide access up and down the bleachers. Most aisles require handrails and nosings unless certain conditions are met. Anodized Aluminum – electrochemical process applied to the surface substrate of the planks that creates a thin but hard barrier that resists corrosion, flaking and chipping. This anodic-oxide finish also provides a more vibrant look to the aluminum bleacher planks. Backrest – aluminum extension or molded plastic seat back for added comfort. Dead Load – constant and fixed weight on the columns, beams, foundation, seats and basically the entire bleacher structure. Decking – opening between seats and foot planks. Elevated aluminum bleachers – bleachers where the spectators’ feet do not touch the ground and people must walk up the stairs to sit. These bleachers offer better views of the field. End cap – piece placed at the end of the seat plank or foot plank to protect spectators and provide a finished look. Foot plank – the bottom piece where spectators place their feet. They come in single plank or double plank for wider spacing. Grandstands – larger bleacher seating systems that are permanently installed. Commonly used in stadiums and race tracks. Guardrail – protective chain link mesh or vertical picket. Bleachers more than 30” above grade much have a 42” guardrail. The guardrail must not allow a round object more than four inches to get through. Handrail – a railing for people to grasp when climbing up the steps. International Building Code – Building code written by the International Code Council for buildings and other structures. This construction code is a standard that is followed throughout most of the United States. The ICC has created guidelines for aluminum bleachers. Live Load – the different load on a structure that constantly varies with the number of people and objects placed on a set of bleachers. 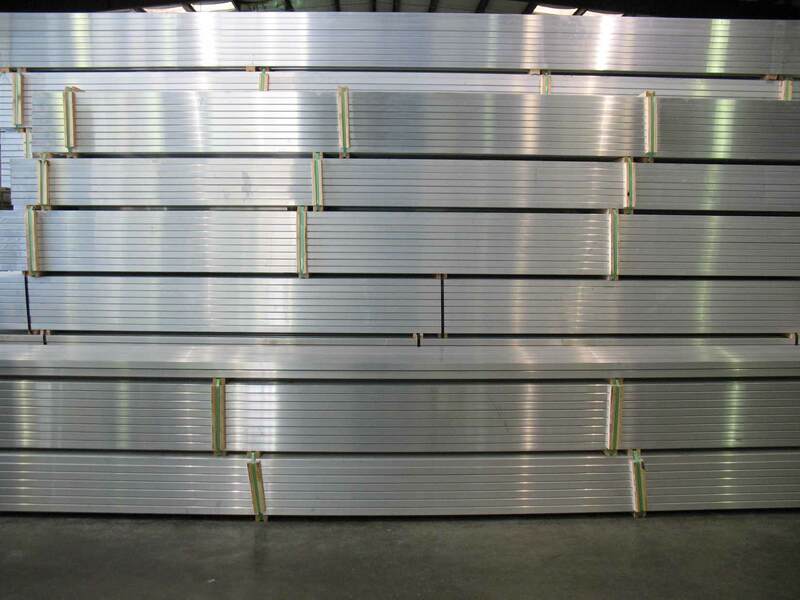 Mill Finish – natural finish of aluminum planks after extrusion and it exists the mill. Can show uneven wear from foot traffic. Portable Bleachers – these are bleachers than can be relocated from one field to another with the use of a tow-kit. They are generally moved by a tractor but cannot be towed on an open roadway. Also called “transportable” bleachers. Powder Coatings – a dry powder that is applied electrostatically to metal and is more durable than conventional paint. The advantages of powder coating are: there are a large number of color choices, resistance to harsh weather and UV rays and the prevention of cracking and peeling. Rise – the size of the increase in elevation from one row to the next. Riser Plank – a protective plank that is placed vertically under the seat. This blocks anything from falling from under the seats. Must not leave a gap more than four inches. Run – the length from the front of one seat plank to the front of the seating behind it. Seat Plank – where the spectator seats. Also called a Seat Board. Seating Capacity – standards to determine the size of the bleacher structure depending upon the number of spectators anticipated. The standard space per person is generally 18” per seat. Divide this number by the length of the seat plank to determine the number of spectators per row for aluminum bleachers. Seismic Load – engineering term for levels of earthquake-generation agitation of a structure and the potential effects of an earthquake in a horizontal direction. Sightline – the visual, unobstructed line for a spectator to view a field or stage. Tip and Roll Bleachers – smaller aluminum bleachers with wheels that can be easily moved from one location to another. Usually no more than four rows. Tread – applied to the surface of the bleacher steps. Wind Load – calculations regarding a structure’s ability to withstand high winds.